Frost may be coming this weekend, especially on Monday. 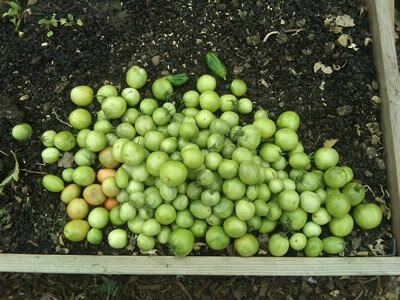 I decided to remove the pepper and tomato plants yesterday during my lunch break. 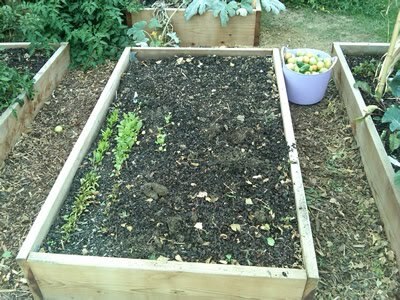 The garden looks like the picture I took on May 7 (24 weeks ago!). It is a sad time....I enjoyed my daily breaks from the computer. A fellow gardener told me it is just the cycle of life. We were blessed with a long warmer autumn. I look forward to the spring after a winter of reading and knitting! One thing that amazed me is how many tomatoes one plant can give me! Here are all the green tomatoes that were hidden in the tomato bush as I slowly took it apart for the compost area. 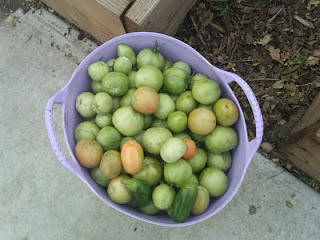 The plant gave me a bushel of tomatoes! I will continue to blog. There is still an autumn crop in the box....and I have a friend who is trying a cold frame this winter. I can always dream about the spring!